We are collecting links and product recommendations on this page to help you in your study of the Bible. 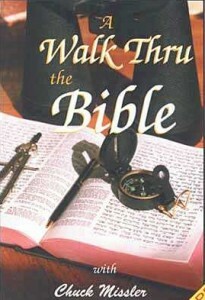 Information about Bible study is also available in our section, Know Your Bible? 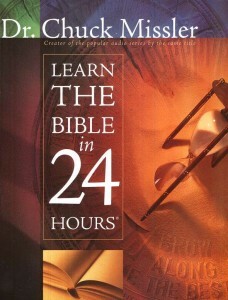 This is a way to read through the New Testament in 5 minutes a day, 5 days a week, with 5 ways to dig deeper. It comes from NavPress at no cost. Like the 5x5x5 plan, this plan is a 5 day per week program. Instead of just the New Testament, this plan begins in Genesis and goes through Revelation. 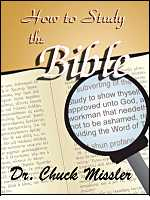 It does not try to cover every book in the Bible, but does present the high points in order to give a reader an overview of the Bible by using the Bible. This plan has 25 readings each month, so you can have some days available for catching up or extra study. There are four different parts to read each day, from different books. Using the full plan will cover all of the Bible in one year. The BLB project states that their mission is to, “facilitate in-depth study of God’s Word through an on-line interactive reference library continuously updated from the teachings and commentaries of selected pastors and teachers who hold to the conservative, historical Christian faith.” Their service is free. This is a program that you can download at no cost, or for a donation. It has several versions of the Bible, commentaries, scholar’s tools, and a search program. 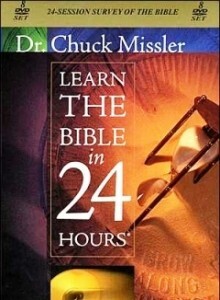 If you like working on a computer, this may become your favorite Bible for individual study. Whether you want to explore some of the less-discussed nuances of Scripture or you need a comprehensive refresher course on the Bible’s themes and stories, this study is a great guide. It is an excellent resource for those who are just starting, or those who wonder what kinds of books a teacher like Chuck relies upon. 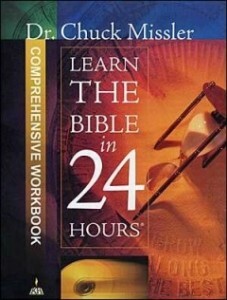 This is a set of 2 CD’s recorded by Chuck to provide an overview of the Bible. He explains how integrated the entire Old and New Testaments are in an upbeat manner. I’d like to be added to the mailing list. Dr. Missler has taught me so much. The gratitude I have for him for his faithfulness and to his wife for hers is immense and cannot be adequately expressed in words. The loss I feel though never even having meet him personally is so great sometimes I can’t stop crying..I rejoice for him knowing he is home with the Lord, but hey, he’s gone! lol! and you know I’m just being real. I look forward to seeing him and Nancy, meeting them and thanking them for being who they were created to be and teaching me how truly amazing the Bible is, that it is the Word of God. Thank you for the way of agape and be ye transformed. What a blessing, what a good teaching. I pray Adams Road will be blessed.